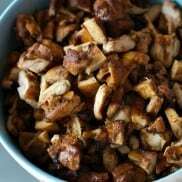 Perfect for a Budget Cinco de Mayo Party, boneless skinless chicken thighs are not only easy, they are affordable and delicious for taco bowls, tacos, enchiladas, or tostadas. 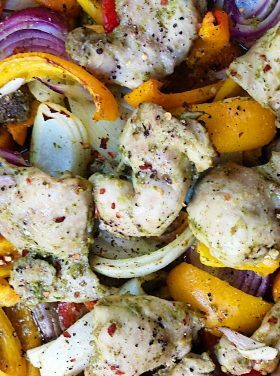 Honey Lime Boneless Chicken Thighs are marinated overnight in a honey lime sauce, ready for broiling or grilling the next day! Friends, today enjoy this tasty Honey Lime Boneless Chicken Thighs recipe! 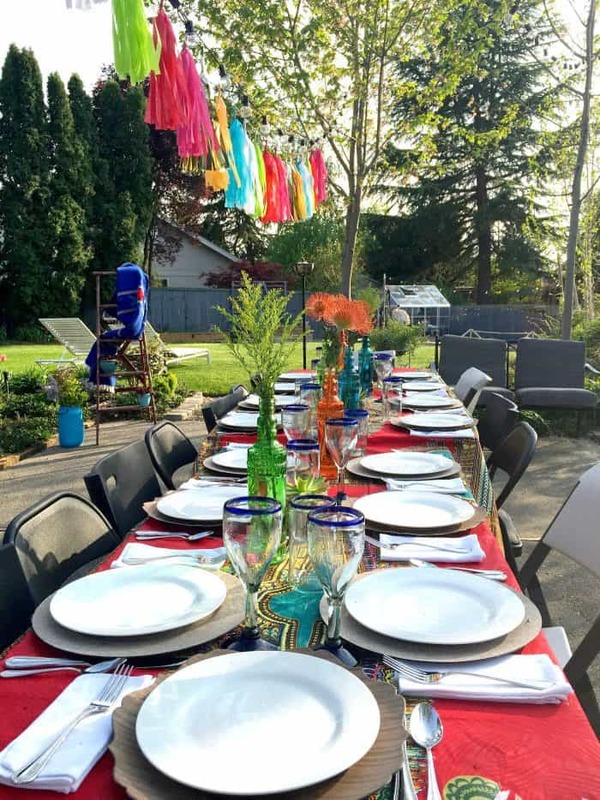 Sky’s the limit when creating a budget-friendly Cinco de Mayo party! 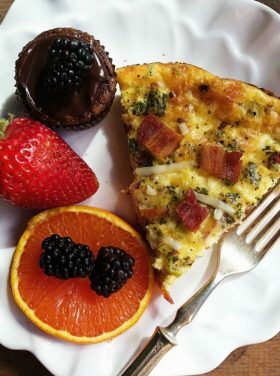 When you plan ahead, borrow, delegate, and stick within your budget, you’ll feel good about hosting a party that combines delicious foods with fun and a festive spirit. 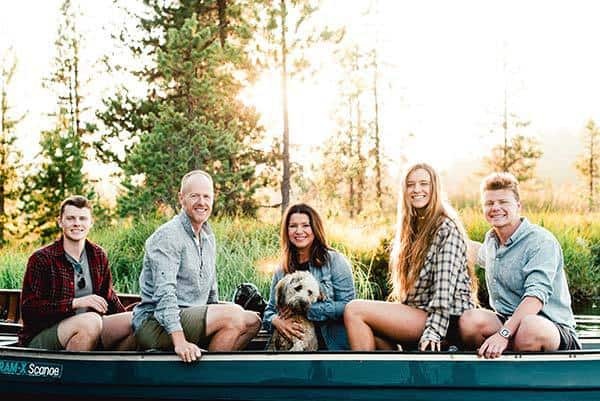 First of all, we love to bring people together in our home, but quite honestly, we do not have the budget to provide the entire meal – especially for a large group! But large groups are fun, so how do you pull this off? I’ve learned to use the resources that we have, borrow what I don’t have, and invest in a few inexpensive things (usually from the Dollar Store). What makes a party complete? Besides the people, the table setting is important, but serving healthy foods is also on the top of the list for me. Guests love to build their own plates with a potluck or buffet-type setting, and then gather together at one big table! Decide what your budget is for the party, and stick to it. Shop the Dollar Store, borrow from friends, delegate the dishes, and invest your time into making the party ambience festive and fun! 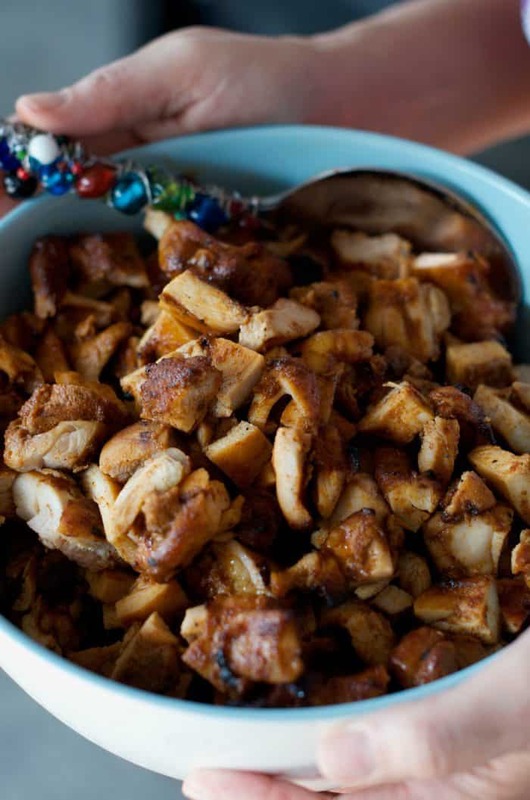 This boneless skinless chicken thigh recipe is easy to prep ahead of time. 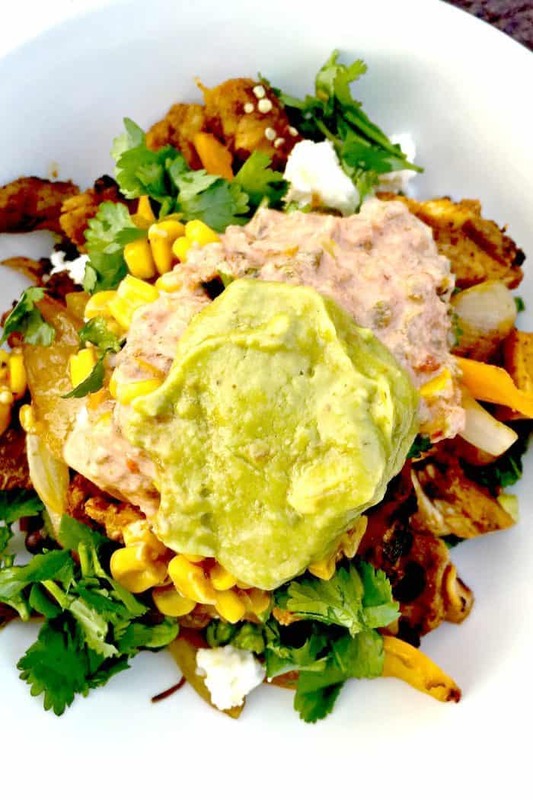 Combine a variety of salads, toppings, rice, beans, meat, and chips and dips– and you’ll have very happy guests. We used our side patio with lights already hung, added an extra table, and hung a festive tassel garland. I already had the (Dollar Store) white dishes, chargers, and ironed white cloth napkins. You may need to grab a few extra chairs from your neighbors as well. Or borrow extra glasses (I didn’t have enough of the Mexican-rimmed glasses, so I borrowed a few). Everyone brought food and drink. 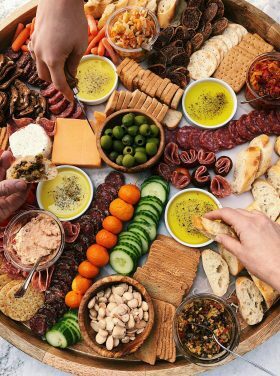 If the host provides the meat and a few sides or toppings, guests can bring the rest of the food, making this type of party very budget-friendly. Ask each guest to bring their favorite wine or beer, or if you’re feeling generous, make up a few batches of this sangria recipe. My friend brought me flowers from her yard, and I bought one bunch of orange flowers from Costco ($8.99). I bought tall, vibrantly colored bottles for flowers, and clear glasses for water– all purchased from the Dollar Store. I spent about $10. I reused the succulent centerpieces (with dry beans) from a previous party. For music, my husband pulled up a Pandora Mexican instrumental music playlist – and the party began! 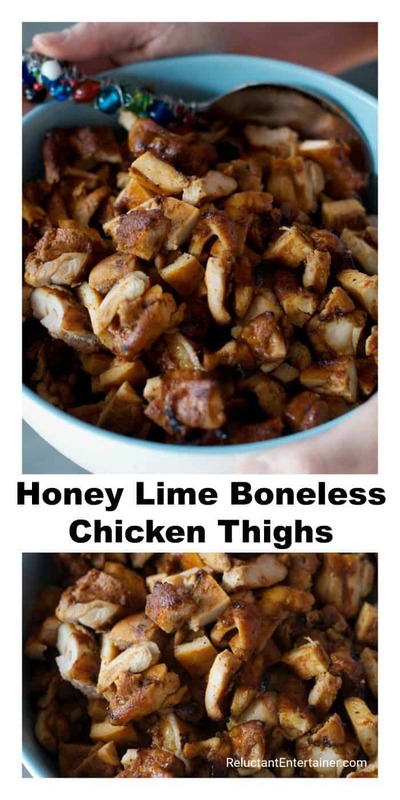 Now for the delicious Honey Lime Boneless Chicken Thighs recipe. It’s very easy! Marinate the chicken overnight. Broil or barbecue ahead of time. Cut into small pieces. 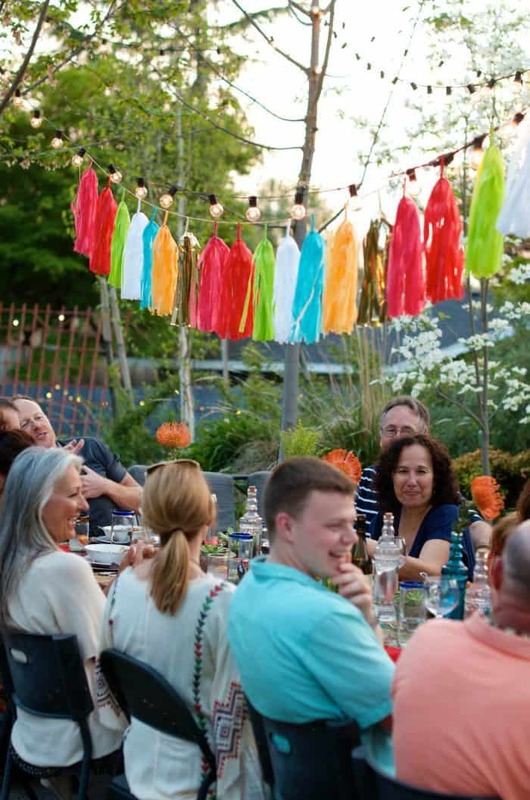 Serve with your Mexican feast, or use the meat in any Mexican dish, such as enchiladas, tacos, taco salad, tostadas, or rice bowls as we did at our party! The goal for me as a hostess is to create a cozy space for friends to gather and hang out—all night long if they wish! 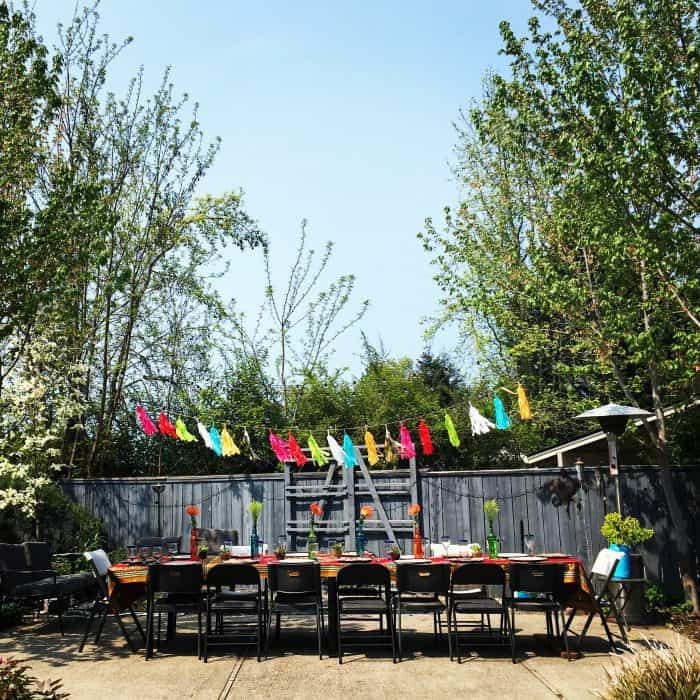 So with all these details, I hope you’re inspired today to host your own Cinco do Mayo party, or a festive Mexican-themed party! 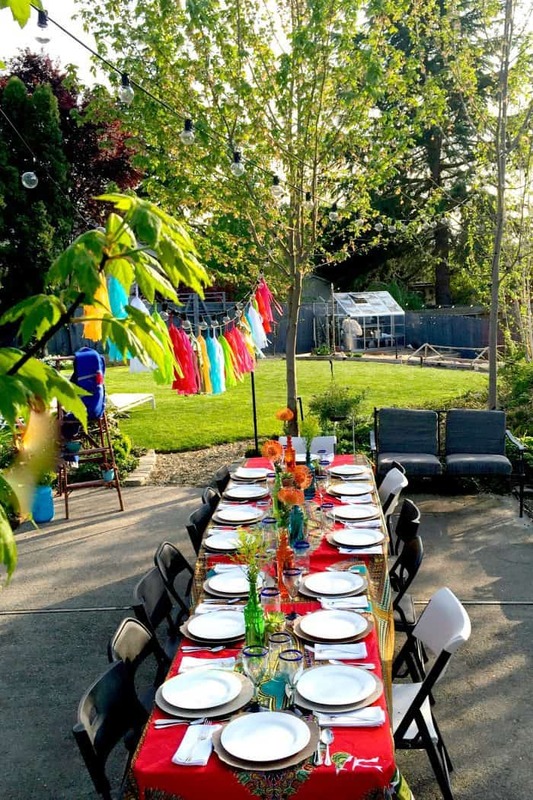 It’s an easy and fun party to host in the great outdoors! 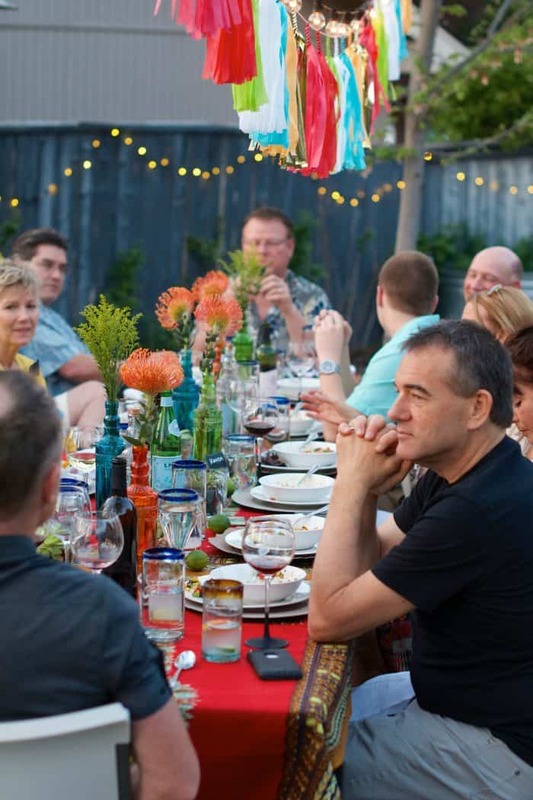 What ways have you learned to cut costs when hosting a larger dinner party? 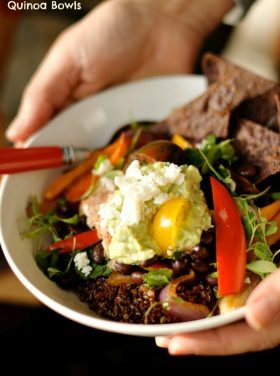 Serve at a Mexican Fiesta! Make the day before; cut into small pieces. Reheat before the party! Prepare the chicken (cut off any fat) and place in a ziploc bag. 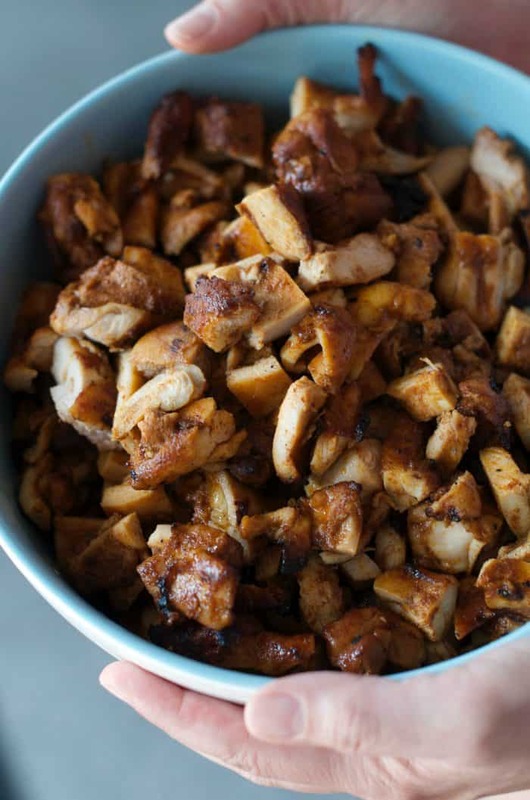 Mix together the paprika, chipotle powder, cayenne, salt, lime, and honey in a bowl. Pour over the chicken and marinate overnight in the bag. Squeeze out the air in the bag. Broil the chicken for 4 minutes on each side (or grill until done). Cut into small pieces and serve as a side meat to go with any Mexican buffet. This post was originally part of a partnership with Garden of Eatin’® . All opinions are my own. This post was originally posted May 2015. 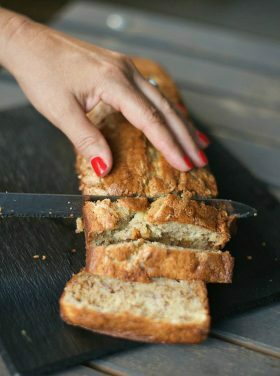 I make this recipe a lot! It’s probably our favorite recipe for chicken in a taco. The left overs freeze and reheat really well, too! Oh my Gawd Sandy! This looks amazing! I want to come to a party soon, I’ll help setup!! I’d LOVE to attend one of your parties! You have a special knack for entertaining. Plus that chicken looks fabulous!!! 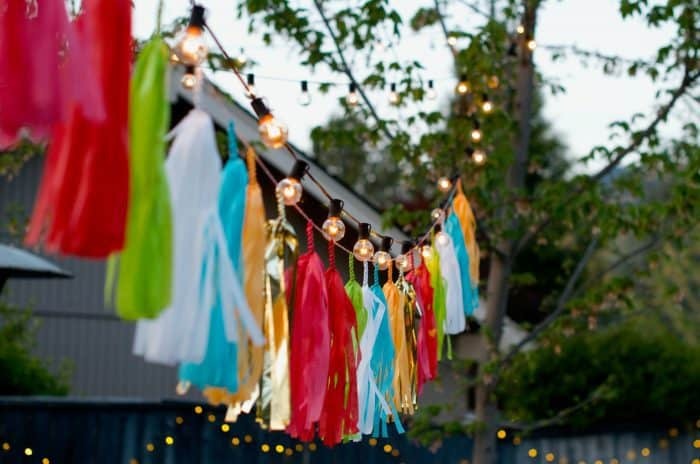 These are some great tips for throwing a party and I love your decorations so festive! 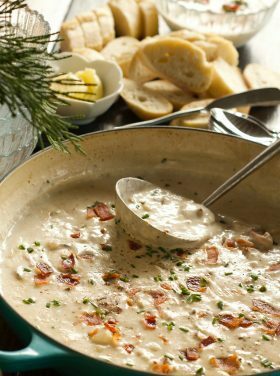 That chicken recipe looks perfect a simple weeknight meal too. Oh and I love Garden of Eatin’ chips, I didn’t realize they make Catina Style, I’m going to have to look for that now. What a great party recipe! LOVE this! I always find great ideas on your party posts, the lime place cards are genius! And after the party I can recycle those limes for margaritas! 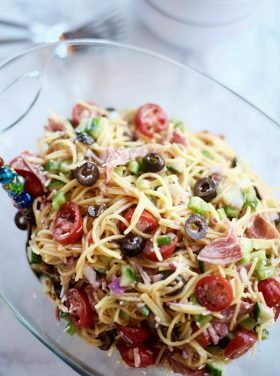 This looks incredibly flavorful and so delicious! My family would really enjoy this for dinner!